UPDATED: Mon., June 18, 2018, 10:46 p.m. 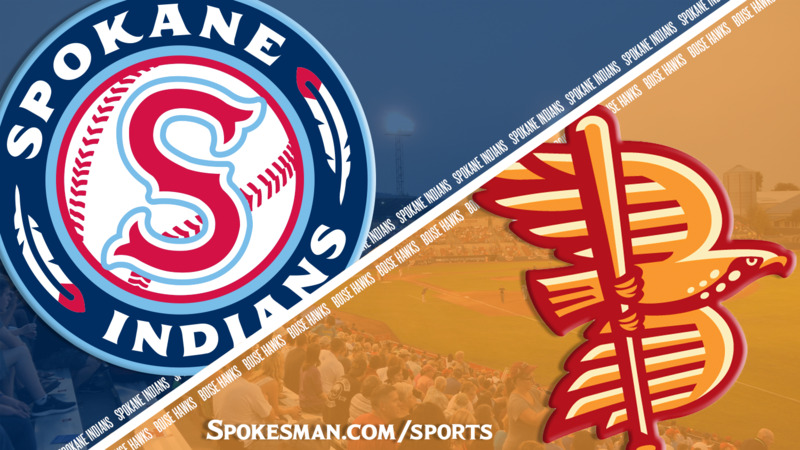 The Spokane Indians are getting decent starting pitching at the start of the season, but the bats haven’t quite caught up. Seth Nordlin gave up one run over five innings but the Boise Hawks scored twice in the eighth inning to edge the Indians 3-2 on Monday in the fourth of a five-game Northwest League season-opening series at Avista Stadium. “He went out and pitched with conviction,” manager Kenny Holmberg said about Nordlin. “It’s just a sign of what’s to come with our starting rotation. Nordlin echoed his manager about the starters competing – at everything. Though this was Nordlin’s first start of the young season, it was not his first appearance. The 13th-round pick of the Texas Rangers in 2017 was the last of six pitchers utilized by manager Kenny Holmberg on opening night, allowing one unearned run with a walk and a strikeout in one inning. Nordlin got into trouble right off the bat. With one down in the first, Cade Harris singled up the middle and stole second. Nordlin got 2017 NWL all-star Daniel Jipping to ground out, but Danny Edgeworth lined a single to left and Jonah McReynolds’ throw home was late. In the bottom half, leadoff hitter Miguel Aparicio singled and went to second on a groundout. With two down, Jonah McReynolds put a charge into one, but left fielder Matt Hearn made a leaping grab at the wall to rob McReynolds of extra bases – and an RBI. Nordlin settled into a groove. From the last out of the first inning through the top half of the fifth, he retired 13 in a row, picking up three strikeouts along the way. Nordlin was lifted after five innings. He allowed the one run on two hits and no walks with three strikeouts. He threw 61 pitches, 40 for strikes. Curtis Terry tied it with one swing in the bottom of the fifth. The Indians designated hitter clubbed a two-strike fastball from Parra well over the left field fence for his second home run of the season. Hasuan Viera singled with one out and after a popout, Tyler Depreta-Johnson ripped one down the third-base line. Edgeworth made a nice grab but didn’t have a play at first. He faked the throw and Viera, running hard with two outs, didn’t pick up the fake until too late. Edgeworth got Joseph into a rundown and eventually tagged him out to end the inning. In the sixth, reliever Cole Uvila made his first appearance of 2018. The 40th-round draft pick in this year’s draft allowed a single to Kennard McDowell, but the Boise shortstop was thrown out attempting to steal. Uvila then struck out Hearn and Harris swinging. Opening day starter Royce Bolinger came on for the seventh inning. He walked his first batter but struck out Edgeworth and Depreta-Johnson started a nifty 5-4-3 double play to get out of the frame. He didn’t fare as well in the eighth. LJ Hatch led off with a single and went to second on a wild pitch, then scored two batters later on McDowell’s line-drive double to the right-center gap. Holmberg came out for a visit, but it didn’t take. Hearn ripped a sinking liner to center and Aparicio made a sliding attempt, but the ball came out of his glove and it went for an RBI single and 3-1 lead for Boise. Isaias Quiroz put a charge into one with one down in the eighth, but Hearn made a running catch near the line to retire the Spokane catcher. Aparicio made it a one-run game in the ninth with a no-doubt home run to straightaway right that cleared the plaza area, but the Indians couldn’t find another run to tie it. Transactions: RHP Werner Leal was transferred from High-A Down East to Spokane. He is scheduled to start on Wednesday at Tri-City. INF Kenny Mendoza and RHP Luis Rosario were transferred from Spokane to Arizona League. Published: June 18, 2018, 9:03 p.m. Updated: June 18, 2018, 10:46 p.m.